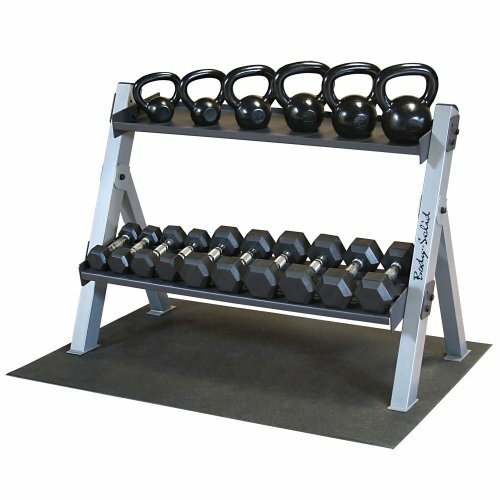 Body Solid GDKPACK features GDK100 Kettlebell Rack, 5-30lb Kettlebell Set, 3-12 lb Dumbbell Set, and a Rubber Equipment Mat. Configurable weight platforms flip to hold either dumbbells or kettlebells. Keep your workout area organized, clean and, most importantly, safe. Our weight trees and dumbbell racks can be placed against any wall or centered in a room. Nobody builds stronger or more space efficient storage units. Heavy gauge steel with all-4-side welded construction is deburred inside and out for user safety. Package includes: GDK100 Kettlebell Rack, 5-30lb Single Kettlebell Set, 3-12 lb pair Dumbbell Set, and a Rubber Equipment Mat.